You can see the dress on Sincerity Bridal's website. It's dress '3785' if you use the search bar at the top of their site. My dress is different colors than the main picture on the site though. 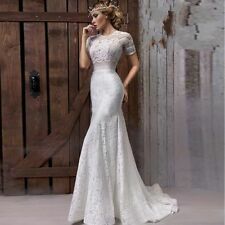 This dress has a champagne slip with an ivory lace overlay and it has been professionally cleaned. A waist-deep V-back and sweeping train ensure a head-turning exit. Wedding Suite. Square neck. Fitted waist. 68" front length; 73" back length (size Large). 100% polyester lace. A waist-deep V-back and sweeping train ensure a head-turning exit. 100% polyester lace. Square neck. Fitted waist. I mark the clothing inside, & check when I receive it back. unless stated or shown in photos. Elegant hourglass wedding dress, worn once. Size small, bust size 34, waist size 24, hip size 34. Lined lace body,see through lace arms, netted lined short satin train, backless, buttons around the neck. "DA VINCI" BRIDAL GOWN. Built-In "adjustable" corset ~ comfortable not constricting. Gown is covered with a sheer layer of lace. STUNNINGLY "GORGEOUS" GOWN! FYI: A friend of mine (she models) tried this gown on recently and it was. 1: If you want the dress, it will be not include any accessories such as gloves, wedding veil and the crinoline petticoat ( show on the pictures). The date you need dresses:_______. 4: Dress Can Be Made in Custom Size, Color, Design. A: The wedding dress does not include any accessories such as gloves, wedding veil and the crinoline petticoat ( show on the pictures). If you don't have the request, We will make standard back. Outer Leg: __cm (from waist to floor with your shoes on). 1: If you want the dress, it will be not include any accessories such as gloves, wedding veil and the crinoline petticoat ( show on the pictures). We will do our the best to make you the best dress and provide you the best service. Material:Soft Satin Organza Lace. Note:When you have bought this dress,you had better inform us about your height,weight,bust and waist,so that we can check your size carefully. Back Design:Zipper. We will try our best to give you the best solution by communication. A: The wedding dress does not include any accessories such as gloves, wedding veil and the crinoline petticoat ( show on the pictures). Closure at Back. High product quality. We will do our best to solve your problem as soon as possible. Stardand Size Custom Made Size. It will take about 4-5 weeks to finish. The item does not include any accessories such as gloves, wedding veil and the crinoline petticoat ( show on the pictures). We may fold the gown inside out to protect the beading or lacing.